Before travelling with a cat, make sure that you have everything you need. Travel supplies include a good carrier (free roaming cats in cars often head for the foot pedals when panicking), at least two blankets or towels, a cat toy, food for long journeys, treats andcleaning supplies in case the cat has an accident. The ideal cat carrier is made of sturdy material such as metal or heavy plastic (not cardboard or thin, flimsy plastic), provides good air flow and is easy to clean. If travelling by plane, the airline may require a specific type of carrier. It’s a good idea to look into this before embarking on the journey. When travelling with more than one cat on long journeys, each should have his own carrier, as the stress may cause cats that ordinarily get along to fight. In cars, carriers should be either secured to a seat with a seatbelt or wedged behind the front seats. Cats in carriers should never be left in the trunk of a car. If you stop for food or anything else and will be more than a few minutes, bring the carrier. Cats can succumb to heatstroke quickly in hot cars. If you’ve never travelled with your cat before, you may want to take a test drive so that there will be no nasty surprises. First allow your cat to become accustomed to his carrier. You can create pleasant associations with the carrier by giving him treats or favourite foods inside or near it. Once your cat is comfortable with the carrier, you can try a short local drive to begin with and then increasingly longer drives if the cat is growing more relaxed with the procedure. Offer rewards directly after each trip so that your cat will view travel more positively. Most cats meow frequently at the beginning of a journey but eventually settle down and go to sleep during longer trips. Cats should not eat right before travelling as they may become carsick. Your cat may be exposed to new risks through travel, and some places require proof of vaccinations and other health certificates, so a veterinary check-up beforehand is a good idea. A veterinarian can provide up-to-date shots and if your cat is an extremely anxious car traveller, prescribe a tranquillizer for the trip. It is also important to check pet-related regulations, such as quarantine requirements, if travelling to other countries. When travelling by plane, cats usually have to stay in the hold in their carriers. Cats should be put on direct flights so that there is less disruption and waiting around in hot or cold places in between flights. Sedatives are not recommended for cats travelling by plane as they can affect the way their bodies deal with temperature changes, which could potentially be fatal. 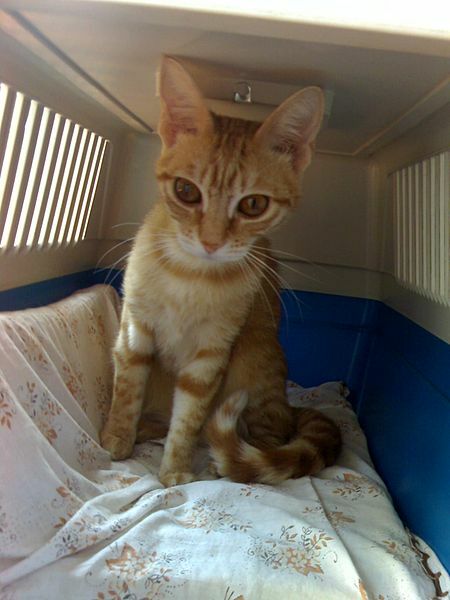 Pregnant cats and kittens younger than three months should not travel by air at all. All cats should have ID tags, and these should be attached to a harness rather than a collar when travelling, as collars are easier to pull off and lose. ID tags should have your name, address and phone number, as well as that of the cat’s veterinarian. Ideally, cats should be tattooed and microchipped as well. A cat with a harness and leash can safely come out of the vehicle with you to stretch his legs at rest stops. If you plan to stay in a hotel, be sure to find out in advance which ones accept pets, and call ahead to make sure that there are pet-friendly rooms available. PetFriendly.ca offers a directory of accommodations in Canada and the United States that allow pets, and PetFriendlyHolidays.com provides a directory for Europe. If you plan to stay permanently or for a very long time at your new destination, don’t let the cat out for at least seven days and update ID tags with the new address and phone number as soon as you arrive. For more cat articles, see the main Cats page. For dog articles, see the main Dogs page. Franny Syufy. (2008). “Top 6 Ways to Ease Travel by Car with Cats.” About.com. Feline Advisory Bureau. (n.d.). “Travelling with Your Cat.” FabCats.org.